A little about yourself your edication family life etc. Am filipino-german,under-graduate. I travelled a lot and still do in Europe and Asia my homes and my favorite continents. I left the Philippines at a very early age ventured my luck in Karachi,Pakistan where i’ve worked and lived for 11 years! 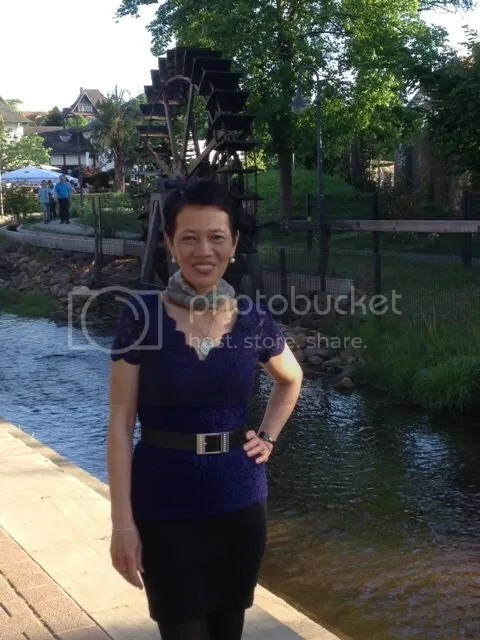 Am working as a humble saleslady specialized in selling Euro cheese and Wine! I have developed a fine taste of both great products and became a gourmet freak! I love outdoor activities namely bicycling,hiking and long walks! Fiona: When did you begin writing? It was a good friend of mine from Australia who inclined me to write simple poetry,from there i discovered my skills in writing! I considered myself a writer when i first joined with other poets to write an Anthology book of poetry published in 2014! The nature is my greatest inspiration until now! I consider myself a versatile poetess though my very love is the nature,but i could write about anything that inspires me. I am a spontaneous writer,my subjects vary but again nature is foremost! The very message is that i wish to remind my readers and reiterate often enough to love and care for the nature! All sales of copies of my nature book as well as the Collab book which i wrote with Author Susan Joyner-Stumpf will be donated to various institutions to protect The Mother Earth and her habitats! Fiona: How much of the book is realistic and are experiences base on someone you know,or events in your own life? I write about my journey and observations about the nature and life – that’s realistic to me! Funny and perhaps strange enough…I used to love reading books written by Robert Ludlum and Wilbur Smith – the underworld ,thrilling stories but they never inspired me! My mentor is my very close friend Author Susan Joyner-Stumpf,who recognized my talent,my creativity and the love for nature our strongest bond! Again the great influences of Author Susan Joyner-Stumpf, Art Kingston,Baidha Ferqoc,Jeff Horbachuk,Clarence Ferguson Jr.,just to name a few – these are my fellow wonderful poets with their own unique styles of writing! My dear friends and readers from facebook are my greatest supporters! No,i do not see writing as a career! To me writing is a passion! But if i’ve given the chance and luck,i gladly make it as a career,but for now it’ll remain a pure passion! Fiona: If you had to do it all over again,would you change anything in your latest book? It was my Australian friend who inclined me to write…there i started. Fiona:Is there anything you find particularly challenging in your writing? Well,this never occured to me,as i write whenever am inspired! I love travelling and i write what inspires me. Graphic Artist and Author Susan Joyner-Stumpf designed the covers! Fiona:What was the hardest part of writing your book? The appropriate title and dedications- worried that i would miss friends who truly supported me.. I have learned that through writing i gain knowledge about the literary world and meeting wonderful people. Also,my style in writing has improved! Fiona: If any of your books was made into a film,who would you like to play the lead? Oh hahaha,most of my characters are animals and flowers! Thou i wrote once a poem on”Seven Years In Tibet”,obviously Brad Pitt played the major role in that film – i entered this poem in a competition and won the “fourth place”,hahaha! Yes, for without the great wonderful support of my readers,i wouldn’t be here writing and not being a poetess,for i truly owe my readers so much giving me encouragement and motivation! Oh dear,poetry books written by Susan Joyner-Stumpf,and a novel written by my dear friend Michael Mulvihill – “Siberian Hellhole”! Oh i have to guess,hahaaa! I think a light romantic book from Barbara Cartland,but i can’t remember the title anymore! Comedy makes me laugh! And when i read sorrowful poems about famine and poverty or watching a movie about children who suffer from atrocities and being killed! Again,her name is being mentioned here often enough…yes it’s Susan Joyner-Stumpf because she is a close wonderful friend of mine and i have never met her before in person! Fiona: What do you want wrtten on your head stone and why? Oh i have never thought about that? Oh yes! I love hiking,bicycling,zumba dancing(i go twice a week),cooking and travelling ! To be honest,i watch mostly documentary films about sights and sounds of different countries! I love asian and french cuisines! I love hard rock the likes of Deep Purple,Led Zeppelin,just to name a few! Fiona:If you were not a writer what else would you like to have done? I dreamt of being a flight stewardess to see the world,hahhaa! Fiona:Do you have a blog/website? If so what is it? Eden Hundsdoerfer is an exceptional poet whose uncanny ability to distill and describe nature’s conversations is poetically captivating! I highly recommend reading Eden’s beautiful works! I thank you so much for your wonderful encouragement and great support my dearest friend Baidha Fercoq! Interview of my lovely friend and fellow Nature Poet, Eden Hundsdoerfer by the great Interviewer, Fiona McVie. A wonderful Interview by the great Interviewer, Fiona McVie, who gets the in-depth questions answered by those Artists in the world we admire or meet through Fiona for the first time. I happen to know and Love Eden and consider her one of my Best friends. 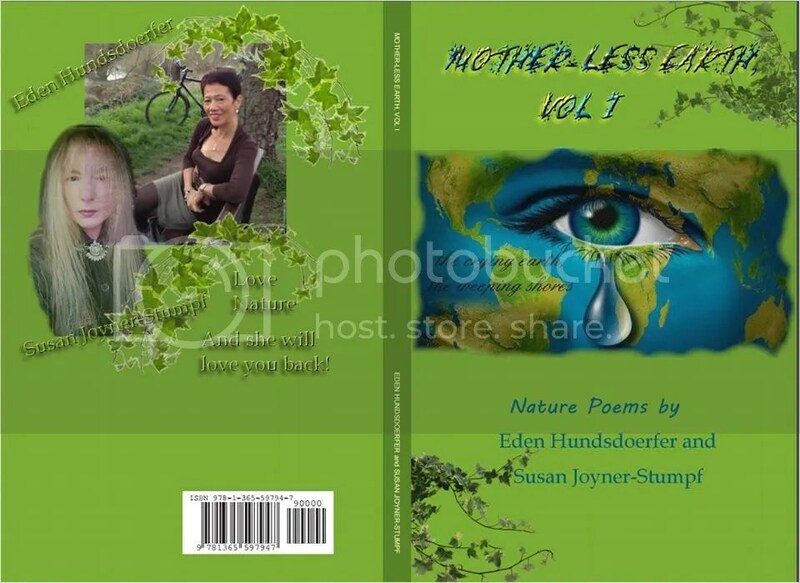 We’ve written a book together, MOTHER-LESS EARTH, VOL I; look for VOL II to be released the week of May 15th. Fiona, what great questions you ask for us to get to know the Authors better …. you bring them closer to us and I thank you for that … for I learned things myself about Eden that I didn’t even know. Thank you both for a wonderful journey into the personality and poetic life of one this decade’s MOST PROLIFIC Nature Poetesses, Eden Hundsdoerfer. Am overwhelmed with joy reading your comment my dearest friend Author Susan Joyner-Stumpf,for you are my very mentor and you have given me that pillar of strength of love and compassion striving to write more and more!Thank you so much for your untiring great support and genuine friendship! I would like to extend my special thanks to Fiona McVie who is a wonderful interviewer,and thanks to Author Deborah Brooks Langford for introducing me to Fiona McVie! My dearest friend Abdelwaheb,you are there almost right in beginning of my poetry writing and you truly inspired me,your words of appreciation is the motor of encouragement and motivation! I hug you with great respect and you remain one of my dearest genuine friends who believe in my creativity in writing! Thank you so much my dear Marites Gueta for taking your precious time to read my interview !